That’s what my coworkers said when I traded in my flip phone for a new smart phone. Trade-in is used loosely here. Actually the flip phone was lost on a recent trip to a hospital emergency room. Oh well, the old battery wasn’t holding a charge as long as it used to. So it wasn’t a total loss. With the usual amount of painful research, I landed on an Android phone. 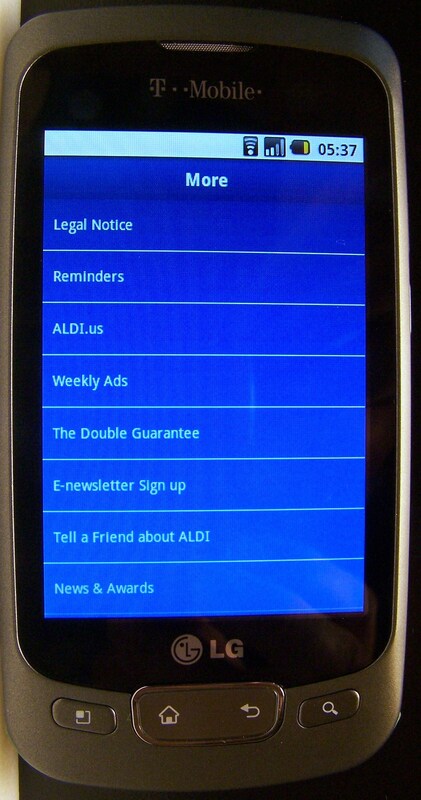 After signing up for a Google account, the first app I downloaded was the ALDI app. Yes you read that correctly, I was one of the 14 people in the world without a Gmail account. A flip phone, no Gmail – yes, some people still do live in caves. The ALDI app is another matter of necessity. Every Tuesday in the mail I used to receive the ALDI weekly circular. I had never signed up for it. There wasn’t an opt-out program. It just came by itself irrespective of my wishes. Each week, for years, the circular took the shortcut to the recycle bin, until I started shopping at ALDI. Now that I shop at ALDI, for some reason it comes when it wants to and doesn’t come when I want it to. That created my need for the ALDI app. The first screen that appears after launching the app is, let’s call it, the home screen. On it is a picture of an ALDI store (nicer than mine). Under that are four selections. The selections today are; specials for this week, specials for next week, Easter (or, I suspect, other seasonal events throughout the year) and new low prices. Right off, this is better than the weekly circular because it lists not only this week’s items, but also next week’s items. Plus it has seasonal items which might be of interest to us. It also lists the new low prices, which also might be of interest to us. This week I took advantage of the new low price for tortilla chips, stocking up on four bags at 99 cents each, because next week they might be the old higher price. Tapping any of the four selections on the home screen brings up the list of items associated with it. The list is in the form of a tiny thumbnail picture, the name of the item and the price. 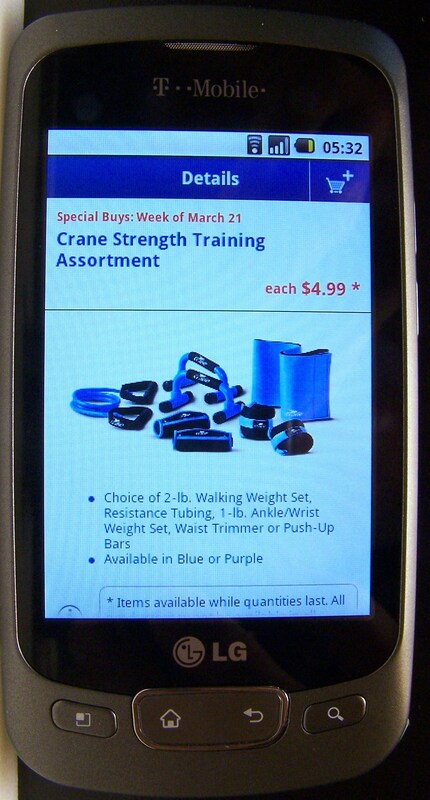 Further tapping the item, brings up another screen with a larger picture and additional details about the product. 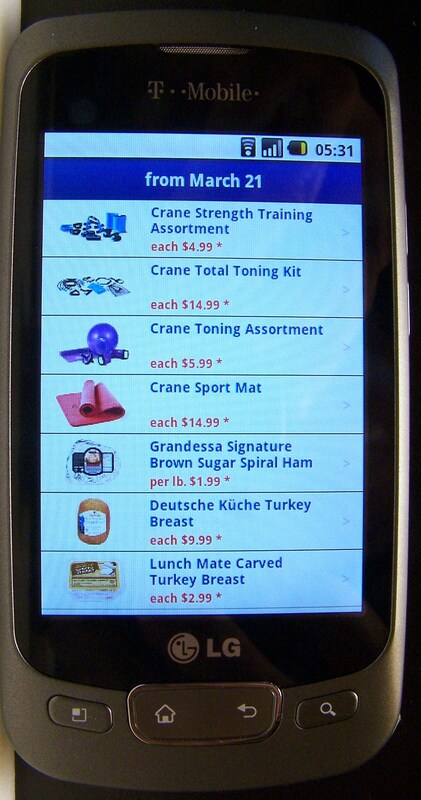 For example, the Crane Strength Training Assortment comes in blue or purple. Purple is for me. 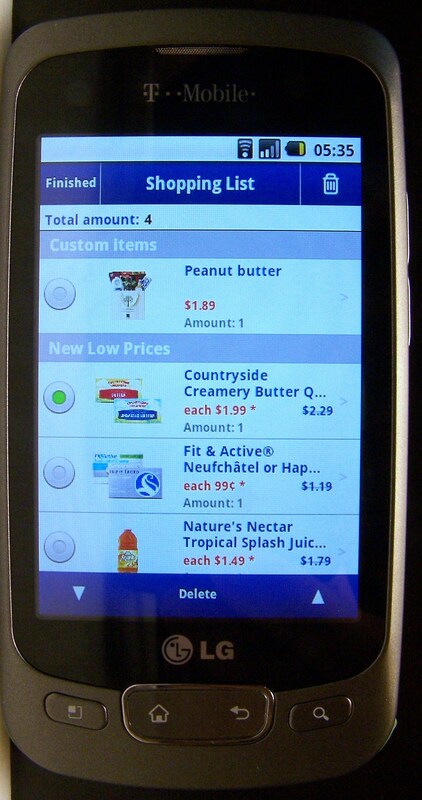 Once on the detail product screen, the item can be added to the shopping cart by tapping the “shopping cart +” icon at the top right of the screen. This is a nice feature and will also total all the items in the cart. That will save the usual embarrassment at the checkout counter when our reach might exceed our grasp – so to speak. If you need more than one of something, you’ll need to add it twice, or more. That’s not the friendliest method. As noted by other reviewers, one glaring omission from the shopping cart concept is the ability to choose your everyday staples. If it ain’t a special item, the ALDI app doesn’t display it. You can however add in a custom item that doesn’t appear in the app, like peanut butter. However, if you don’t buy this on each and every trip, and delete the item from your list next week, it’s gone. It will have to be added in as a custom item the next time you need to buy it. The custom items are not saved as say a, My List. That’s a shame as it’s something a smart phone should be easily able to do. 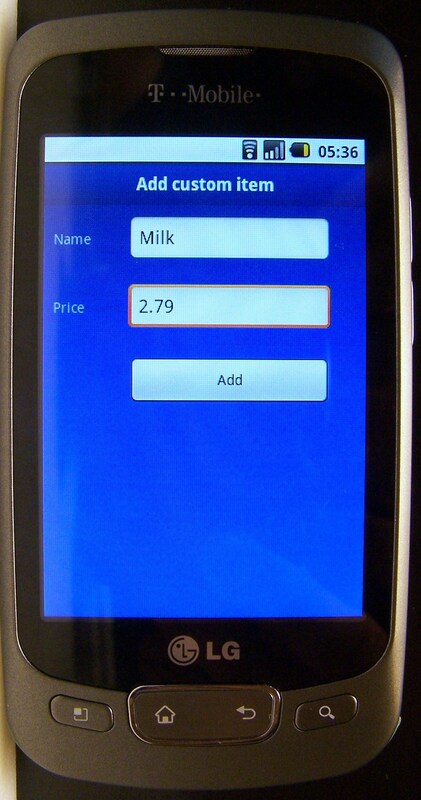 Pressing the typical Android submenu key brings up the submenu which includes selections called; featured, store locator, shopping list and more. Store locator brings up a list of stores near you. Featured goes back to the home screen. Shopping list brings up the shopping list you’ve created by tapping the shopping cart + icon previously. Once in the shopping list you’ll be able to see all the items you selected, the total cost, and can edit the list (limited to deleting items) by tapping edit at the top left. Unfortunately you can’t specify quantity from the list. Tapping more in the submenu, brings up … more. More includes things like; legal notice, ALDI guarantee, weekly ads (which pulls up the ALDI web site weekly ads in your browser), a reminder list – with not a hint how to use it, etc. The ALDI app takes the place of the mail I sometimes don’t get. But in the end it’s not much of an improvement over checking things on the paper ad with a marker and writing other things in the margins. With some simple improvements, it would be much more useful. Here’s a final photographic note. 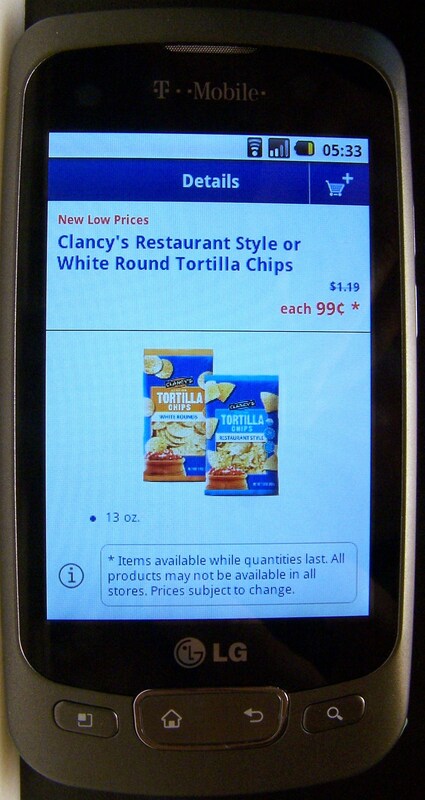 Although the ALDI app colors are predominantly blue, everything does not have a blue tint as in the pictures above. I’ll work on finding the right white balance setting the next time. 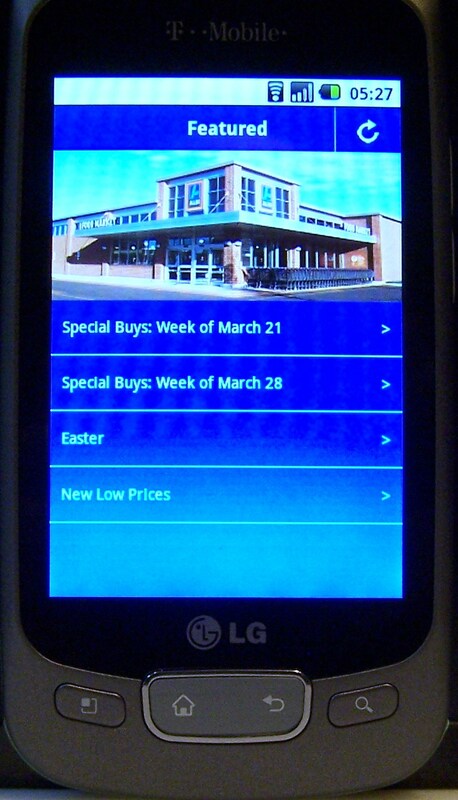 This entry was posted on 03/27/2012 at 08:47 and is filed under ALDI, Recipes, food, cooking and related items. You can follow any responses to this entry through the RSS 2.0 feed. You can leave a response, or trackback from your own site.